The old investors’ advice to “Never invest in something you don’t understand” strikes a powerful chord in the wake of warnings about the risks of Exchange Traded Funds (ETFs). Often tagged as exotic in comparison to their physical ETF brethren, synthetic (aka swap-based) ETFs use financial engineering to achieve the same ends, but in ways that pose specific risks that every passive investor should know about. 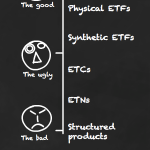 What is a synthetic ETF? 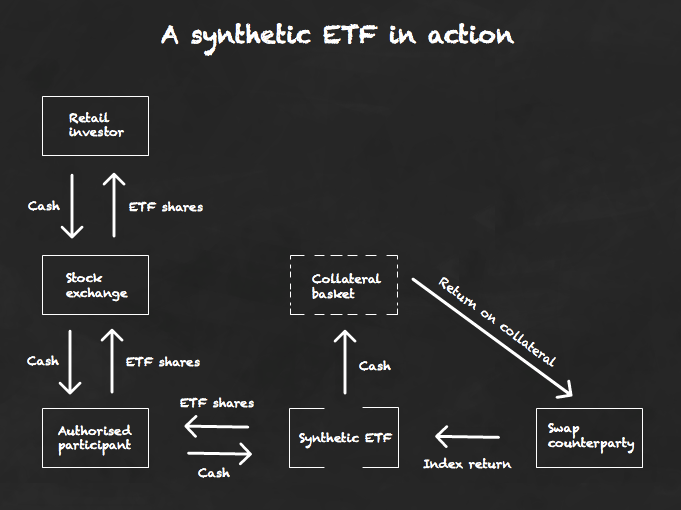 A synthetic ETF is designed to deliver the return of a selected index (e.g. the FTSE 100) just like any other tracker. But it’s the way the synthetic ETF comes by that return that reveals its exotic nature. The most obvious way to track an index is to own all (or most) of its component securities in the same proportion as that index. This way, the ETF should spout the index return minus costs and a few other inefficiencies. That’s how a physical ETF does it. But a synthetic ETF doesn’t bother with any of that old pony. Why go to the trouble of actually owning the shares of an index when you can deliver its return using a total return swap? A total return swap is a financial derivative. In the case of a synthetic ETF, it’s a contract struck with a financial partner (known as a counterparty) to pay the ETF the precise return of its chosen index (both capital gains and dividends) in exchange for a stream of cash. With a total return swap in place, the synthetic ETF can imitate an index without owning a single one of the benchmark’s securities. Short-circuiting ownership means synthetics can overcome many of the tracking error issues that dog physically buying an index. Synthetic ETFs are not tracking error-free, though. Performance is still leeched due to the fund’s TER, and other operational costs like the fee for the swap itself. Many small cap indices, for example, would require a physical ETF to own a massive constellation of equities that would be costly and time-consuming to trade, due to market illiquidity and yawning bid-offer spreads. The effort involved would make physical replication too expensive, so synthetic ETFs step in like robots cleaning up a nuclear reactor. The explosion in synthetic ETF numbers over the last few years shows how successful they’ve been in opening up markets where physicals fear to tread. Few niches are off limits when you can just buy the return with a derivative. A synthetic ETF’s reliance on derivatives may well send a little shudder down your spine. Derivatives haven’t had a good press ever since credit default swaps triggered the worst financial crisis since the Great Depression. You’re absolutely right to be wary. All this financial engineering doesn’t come for free. The reduction in tracking error comes at the price of heightened counterparty risk. Counterparty risk is the chance that the total return swap provider – even a seemingly indestructible entity like a giant investment bank – goes belly up. Lehman Brothers is the example of a counterparty crash par excellence. If the worst happens, then the ETF’s source of return is cut-off and it’s time to fall back on the collateral. Investor cash sunk into a synthetic ETF doesn’t just go towards buying a total return swap. It’s also meant to buy enough collateral (almost) to fend off disaster. So if the fund’s counterparty blows up, the collateral is sold off and investors (hopefully) get the value of their shares back. Collateral can be held in cash, bonds and the equities of OECD countries. What’s more, European regulations limit counterparty exposure to no more than 10% of a fund’s Net Asset Value (NAV). In other words, the ETF must be backed by collateral worth at least 90% of its market value. In practice, more collateral is often posted than required (known as over-collateralisation), and the ETF may be backed by up to 120% of its value in collateral. The collateral quality counts as much as the quantity. There is no requirement for collateral to be held in the same securities that the ETF tracks. That means the ETF’s collateral basket can be stuffed full of all kinds of whiffy securities – Japanese small caps, unrated bonds – that could be hard to shift in an emergency. The longer it takes to sell off the collateral, the more likely it is to plummet in value in comparison to the ETF. (And let’s face it, the chances are a counterparty will only fail during torrid market conditions.) If that happens then investors take a haircut. i.e. They won’t receive the full market value of their ETF shares. A number of ETF providers publish their collateral policy and the contents of each fund’s collateral basket on their website. I’d argue such knowledge is of limited use to retail investors, though. How ETF providers fund the total return swap has implications for the amount of collateral a synthetic ETF can call on in a crisis. Investors’ cash is used to buy securities that make up the basket of collateral. The return on this basket is swapped with a counterparty for the return on the index. There is little, if any, over-collateralisation. The collateral is legally owned by the ETF provider. Investor cash is paid to the swap counterparty. The counterparty pays the ETF the index return. Collateral is pledged to the ETF’s account held with an independent custodian. The ETF is often over-collateralised up to 120% of NAV. The collateral is only available to the ETF if the counterparty goes bust. The ETF provider is not the beneficial owner of the collateral assets. That last point is crucial. Because the collateral is pledged and not legally owned by the ETF, it can be frozen by a bankruptcy administrator stepping in to clean up the mess left by a failed counterparty. In that scenario, the collateral isn’t released to the ETF provider as promised, but is caught up in the scramble to pick the best bits from the bank’s carcass. This happened during Lehman’s demise, and some investors (though not all) were left dangling for their cash. Synthetic ETFs are not constructs to be feared like killer ASIMO ‘bots from the future. But they do have features to be wary of (as do all investments) and they are certainly more complicated than physical ETFs. So in general, I prefer to use physical ETFs, when I have the choice. Bear in mind, too, that when you look at the securities listed in the index section of a synthetic ETF’s webpage, you aren’t seeing what the ETF owns. This list only reflects the composition of the index that the ETF artificially tracks via the total return swap. What the ETF physically owns, if anything, is found in the collateral basket section of the webpage. There are other synthetic tracker vehicles out there: Certificates, ETNs and some ETCs. They work differently again from synthetic ETFs, but we’ll leave them for another day. 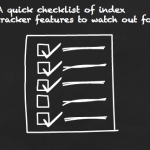 Should tracking error sway the choice between ETFs and index funds? Great post as usual. I must say I really am getting sick and tired of all the investment complexity out there. The rules seem to change almost weekly. In the current day you really do have to be so careful and it is posts like this that help a lot. The average private investor really shouldn’t have to know or understand any of this. I’ve just had a look at the latest db x-trackers prospectus and it runs to 912 pages of small print. I couldn’t hardly believe my eyes. Do they really expect the average investor to be able to read and understand its contents? The average investor just wants to buy the low cost indices (keeping fees low) of his choice, regularly invest some savings, compound it all for 20 years, rebalance regularly and hopefully then if the world still exists retire with a little nest egg that s/he can draw down. It really shouldn’t be any more complicated than this. Of course this doesn’t make the financial sector rich but I’m still wondering why some company out there doesn’t step in to the market as I’m sure you could still make a good living off it. The synthetic nature of ETF’s was one of the reasons I have now moved my Emerging Markets exposure from db x-trackers XMEM to ishares IEEM. At least it’s a little lower risk. I just wish a company like Vanguard would take the UK seriously (rather than their restricted current access) and offer us something like we see in the US. That would then give the Average Joe at least a fair chance of taking control of his/her own destiny and hopefully also get rid of some of the current ETF nonsense. Thank you for giving us a needed lesson in risk. There are so many aspects of risk management. Today’s exotic instruments provide a service and convenience that was previously unavailable to the small investor. They also add another layer of risk management that complicates investing. The important concept is investors should be educated and understand the risks, and you have helped with that important task! 1. Hi TA, as ever, good work. 2. The recent arrival of new ETF issuers on the London Stock Exchange (e.g. ComStage, Amundi ETF) should encourage competition on fund TERs, amongst other things. We know this is already happening in the US. Such competition is of clear benefit to consumers. RIT, I’m instinctively drawn to your seductive dream of a simple world, but I think Ken is right, we have to keep our wits about us. The moment we stop engaging, stop being involved, trust ‘experts’ to look after us like children, is the moment we’re gonna get robbed blind. I don’t think the average investor does want to quietly simmer their savings in an index fund. If the bulk of the press and the balance of the market is any guide, the average investor hopes to make a killing by hooking up with the latest hot fund as recommended by the Great Oz. But it doesn’t take much digging beneath the surface to be quickly disabused of the happy notion that it’s as easy as all that. People have gotta find some of this stuff out for themselves, so they start asking the right questions and putting pressure in the right places, and stop believing in financial fairies. Now I look back, I can’t believe I wasn’t taught the financial basics in school. It’s an essential survival skill. @ Alex – Amundi ETFs are all synthetic. It’s owned by French banks Credit Agricole and Societe Generale. Like RIT, I’ll be happier once Vanguard storms our beaches. Yes, I was aware that Amundi ETF is a tie-up between Crédit Agricole and Société Générale. I find this arrangement strange given that Société Générale, as you know, is a UK ETF issuer itself – as the brand Lyxor. Interesting diversification by Société Générale, isn’t it? Partly playing Devil’s Advocate, but should we really expect index tracking and ETFs to be utterly risk-free and uncomplicated, as RIT suggests? As our ‘investing birthright’, say, rather than another opportunity with its own risks and rewards? This is a form of investing that didn’t exist until the 1970s. For the rest of all time beforehand, the idea you’d put all your money into some sort of scheme that delivered the stock market return minus costs *without* using all manner of sober money managers, top-hatted suits, and time honored German bankerly ways would have seemed bonkers. (It probably did seem bonkers when it was introduced – I wasn’t around to report back). In other words, for all its appeal index investing, and especially ETF investing, is still relatively new. And the history of new financial ideas is littered with ideas that initially seem straightforward, but which reveal a few weaknesses when sent into battle. The problem is compounded because those passive investors who do actually look for the best product (as opposed to buying what they’re existing provider offers) generally ignore or trivialize (present company excepted! 🙂 ) everything but cost. When I used to do more of the passive articles on Monevator, I used to get comments and emails saying why did I always cite L&G index funds and iShares, when there were all these fancy German and French ETFs I could be investing in? One reason was familiarity and writing about what I used myself, sure. But familiarity isn’t a terrible thing in investing, if it means staying power. The older products were also far less complicated in terms of withholding taxes (I didn’t fully understand them in the early days, to be frank, but I knew I didn’t want the hassle or to pay them). And staid replicating index funds seemed to me preferable to saving 20 basis points by running my money in something, well, odd sounding. In summary, it may turn out that there’s a cost to safe and simple index investing, and it may be more than the 0.124% or whatever the latest TER we hear about from the latest new entrant to the US market. 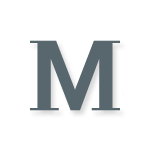 @ The Investor – I don’t think anyone expects investing to be risk-free but given the history of the financial services industry, I think we can be forgiven for occasionally wishing for a retail investor-friendly valley where simplicity and transparency rule. There is something missing from the dream of stakeholder Britain, when the general populace, little schooled in finance, is told to sort out their pensions for themselves, picking products served up by an industry about as regulated as the Wild West. That mattered less when investing was a game for the rich (i.e. those who could probably afford to sustain some losses) but now it’s a game for everyone who hopes to stay out of the soup kitchen in their old age. Much of what is happening in the ETF market right now, isn’t about offering another product with a magically vanishing TER but is about offering increasingly niche funds with fatter costs justified by increasing complexity like leverage or fundamental indexing. In short, simplicity and usefulness are increasingly crowded out by confusion marketing. @Alex – Yes, that’s true, even they’re getting more confusing, which speaks to what TA and RIT are saying I suppose. There’s only two iShares synthetics and they’re both niche. No need to man the lifeboats just yet. The physical optimized ETFs aren’t any better. For example, there is an ETF by SPDR which tracks the MSCI ACWI IMI. The index has about 8500 stocks in theory. But the ETF only holds actually about 600 stocks out of the 8500. This is called ” physical optimized replication”. How they select that 600 stocks, and why exactly 600, is unclear. I also prefer the full physical replication, when the ETF actually buys all the stocks in the index, and that’s it. However, in Europe only about 33% of the ETFs use the full physical replication (soure: http://www.etfinfo.com). So we in the EU must invest in synthetic or optimized ETFs, unless you want to limit your choices. Question: so the synthetic ETFs outsource the index tracking to a counterparty. But how on the earth does the counterparty deliver the return of the index? Does the counterparty actually buy all the stocks in the index? Then what is the purpose of the synthetic tracking? If the counterparty doesn’t buy the stocks in the index, then how does it deliver the return of the index? So the counterparty does “something” to deliver the return of the index. 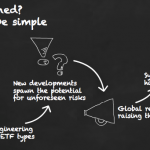 Why cannot the ETF do this “something” on its own, why does it need a counterparty?